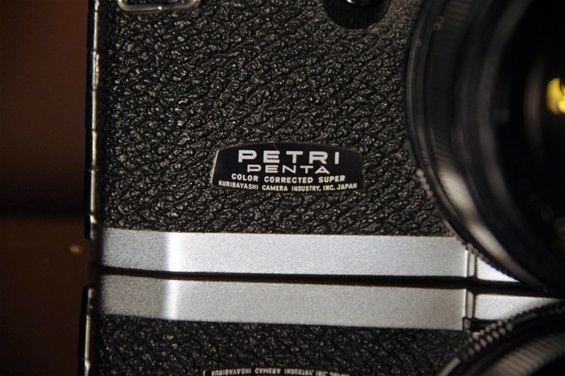 Petri introduced their first PP SLR, the Penta, in 1959. 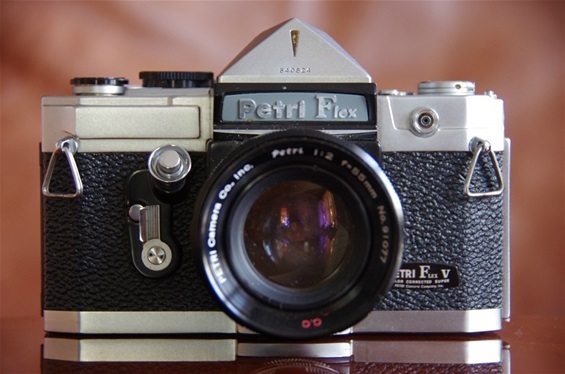 Here is one first version Penta, and one version from 1961, the Petri Flex V. The company was established in 1907 (some sources say 1918) as Kuribayashi Seisakusho and started camera production in 1919 (others say 1922). Petri as a brand name was adopted around 1950 and finally established as the company name in 1962. 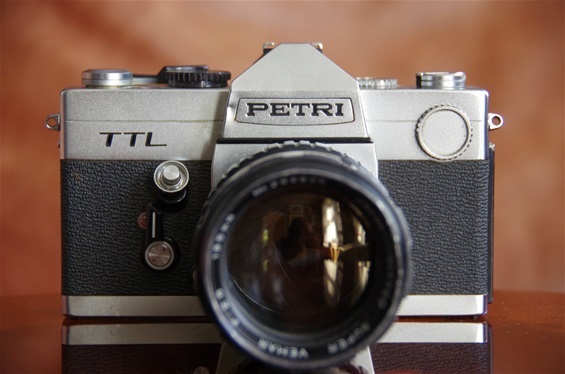 Although starting early, Petri never became a leader in the development of PP SLR cameras. They were always a bit behind and sales did not create the economic power that was needed when heavy automation hit the business during the 70s. Petri went bankrupt in '77. However, the workers took over with employee capital and had the factory going for some years. But as the automation in the business went on, and especially the development towards AF, the company ended production in the middle of the 80's. After that, the British Dixon group used the Petri name on some of their house brand cameras. 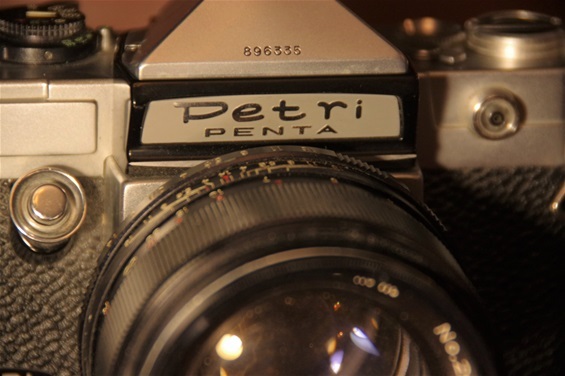 Here is the first edition of Petri's pentaprism slr-camera, the Penta of 1959. It had an M42 mount, and the lens here is a Mamiya/Sekor standard lens from the same era. Later Petris had other mounts. 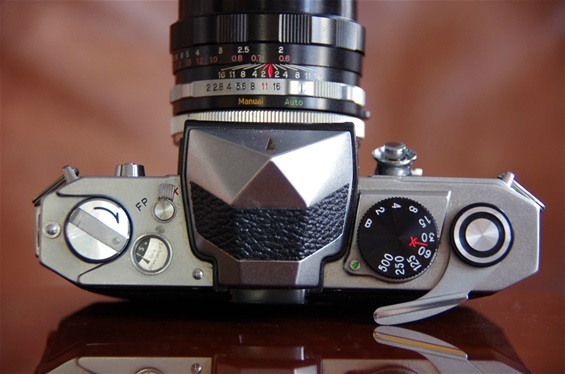 Penta was the model name in Japan, while exported cameras came to wear the name Flex. Note the serial number, 896335. The sn. of the Flex V presented under, is much lower. 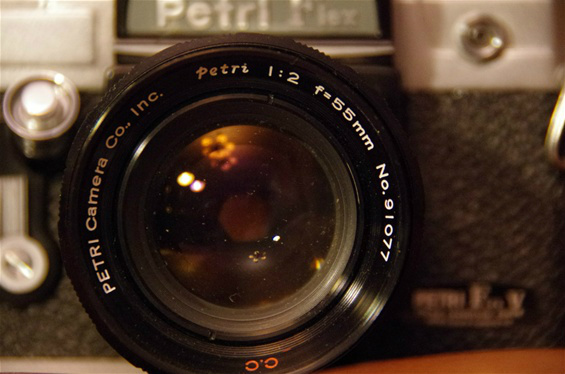 Remember that Petri had made different types of cameras since the 20's, and sold quite many. At this point, they were still making and selling 35mm rangefinder cameras. 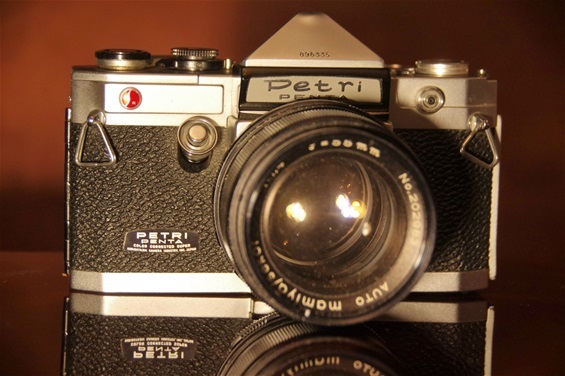 Petri's first series came with the Penta-tag on the right side of the camera. When later models came with a self-timer, the tag was moved to the left. This us a good way to distinguish the first series from others. On the whole, very much looking like the standard set-up after Pentax had shown the way. Short and long shutter times were divided between two dials. The next model had them on one dial, as most producers had done by now. ASA values were chosen by turning the knurled dial around the window near the rewind crank. This very copy was damaged during transport, as one can see on the prism top. 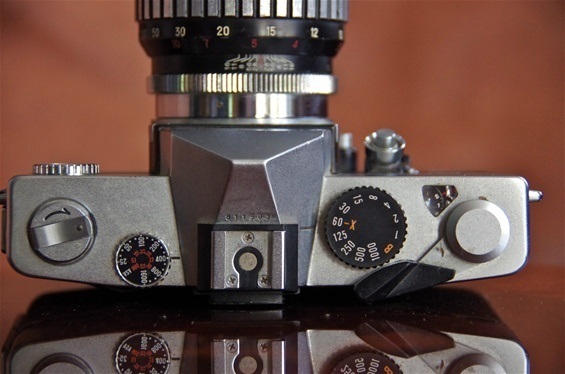 The Petris were stylish cameras with some special construction details, like the camshaft shutter tensioning mechanism. Few have survived in good working condition, though. The first model came with M 42 mount, while later models, like this Petri Flex V of 1961, introduced a Petri breech-lock bayonet mount. Size: 142x93x50mm. Weight: 649 grams. Sn. 340524. Here is a Petri TTL from 1973, which was rather late for a Through The Lens debut. Sn. 811903. 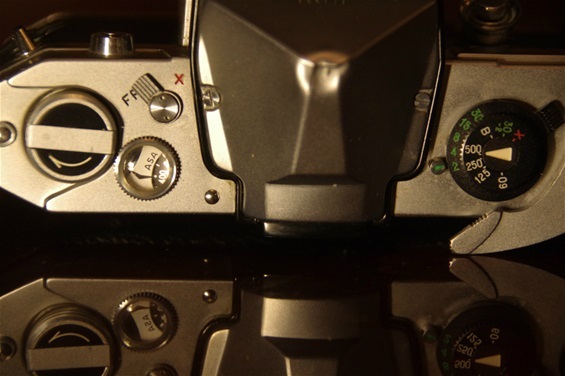 Petri always had the shutter release button like Praktica, in a 45- degree position at the front wall. Rather square shape. Sn. 811903. 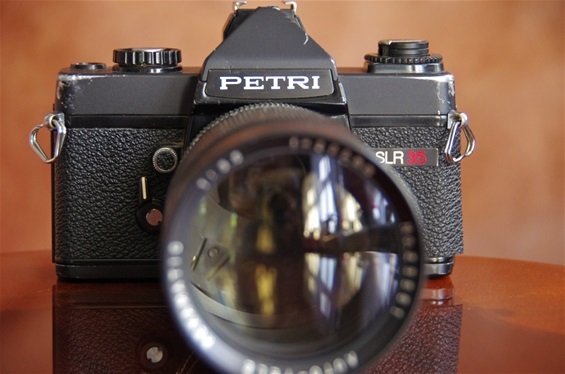 Petri SLR 35. Not easy to find literature about this one. Petri SLR 35 was probably not made by Petri, but by Chinon (or Cosina, though not on the Cosina List) after Petri had closed down. This was not unusual. Miranda and Topcon, too, experienced that after stopping production, their names were used by others and sold sometimes as house brands in western markets. The philisophical answer: the value of a specific object is what someone is willing to pay for it. The SLR 35 was cheap, less than 20$.